To better prepare QA/QC lab analysts and technicians for digitalisation, Singapore Polytechnic’s (SP) School of Chemical and Life Sciences (CLS) and Shimadzu, have set up a Scalable, Manageable, Automated, Regulated and Total-Compliant Laboratory (SMARTLab) to jointly conduct training programmes through the use of instruments that will run on IoT (Internet of Things) and M2M (Machine-to-Machine) networks. 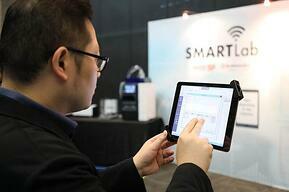 The advanced SMART instruments offered by Shimadzu will be housed at the newly launched SMARTLab@SP. This collaboration is the first of its kind laboratory in a Singapore institute of higher learning in this sector. The SMARTLab@SP simulates the future digitalised laboratory and serves as a learning space for laboratory technicians to learn about laboratory informatics and the use of modern analytical instrumentation. The SMARTLab utilizes not only Shimadzu’s LabSolutions CS Network but also Caliber LIMS Integrated Informatics Platform. It enables users to remotely manage their laboratories’ workflow processes for Sample Management, and Analysis and Reporting with Smart devices from anywhere and anytime via secured network connections. The Integrated Informatics Platform will help automate the communication between the systems, provide real-time data and offer centralised management. Shimadzu’s Integrated Quality Management Solutions are Compliant-Ready to Food and Drug Administration (FDA) Guidelines – the highest industry standard – including Electronic Record and Electronic Signature (ER/ES), and FDA 21 Code of Federal Regulations (CFR) Part 11. Shimadzu's Informatics solutions are widely applied in Pharmaceuticals, Chemicals and other industries. SP’s aim is to provide continuous education to students, providing them exposure to automated, compliant laboratories, as well as upskill the current workforce to enable them to handle higher value tasks, as Singapore transform into Industry 4.0.